A model wears the Owlet Band pregnancy monitor at the Owlet booth at CES International, Jan. 9, 2019, in Las Vegas. The device can track fetal heart rate, kicks and contractions. The latest gadgets want even greater access to your lives. This week's CES tech show in Las Vegas was a showcase for cameras that can livestream the living room, a bathroom mirror that captures your face to offer beauty tips and a gizmo that tracks the heartbeat of an unborn child. These features can be useful — or at least fun — but they all open the door for companies and people working for them to peek into your private lives. Just this week, The Intercept reported that Ring, a security-camera company owned by Amazon, gave employees access to some customer video footage. You'll have to weigh whether the gadgets are useful enough to give up some privacy. First, you have to trust that companies making these devices are protecting your information and aren't doing more than what they say they're doing with data. Even if a company has your privacy in mind, things can go wrong: Hackers can break in and access sensitive data. Or an ex might retain access to a video feed long after a breakup. “It's not like all these technologies are inherently bad,'' says Franziska Roesner, a University of Washington professor who researches computer security and privacy. The new Door View Cam is on display at the Ring booth before CES International, Jan. 7, 2019, in Las Vegas. As with other security cameras, Ring's can be mounted outside the front door or inside the home to give you a peek, through an app, of who's there. But the Intercept said the Amazon-owned company was also allowing some high-level engineers in the U.S. to view customers' video feeds, while others in the Ukraine office could view and download any customer video file. 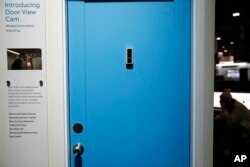 At CES, Ring announced an internet-connected video doorbell that fits into peepholes for apartment dwellers or college students who can't install one next to their doors. Though it doesn't appear Ring uses facial recognition yet, records show that Amazon recently filed a patent application for a facial-recognition system involving home security cameras. A smart home mockup is on display at the Tuya booth at CES International, Jan. 9, 2019, in Las Vegas. Alarm's Wellcam is for caretakers to watch from afar and is mostly designed to check in on aging relatives. Someone who lives elsewhere can use a smartphone to “peek in'' anytime, says Steve Chazin, vice president of products. Just be sure you trust whom you're giving access to. You can't turn off the camera, unless you unplug it or cover it up with something. French company CareOS showcased a smart mirror that lets you “try on'' different hairstyles. Facial recognition helps the mirror's camera know which person in a household is there, while augmented-reality technology overlays your actual image with animation on how you might look. “We know we don't want the whole world to know about what's going on in the bathroom,'' co-founder Chloe Szulzinger said. The mirror doesn't need internet to work, she said. Even if it is connected, all data is stored on a local network. The company says it will abide by Europe's stronger privacy rules, which took effect in May, regardless of where a customer lives. Customers can choose to share their information with CareOS, but only after they've explicitly agreed to how it will be used. Though such data can be useful, Forrester analyst Fatemeh Khatibloo warns that these devices aren't regulated or governed by U.S. privacy law. She warns that companies could potentially sell data to insurance companies who could find, for instance, that someone was drinking caffeine during a pregnancy — potentially raising health risks and hence premiums.